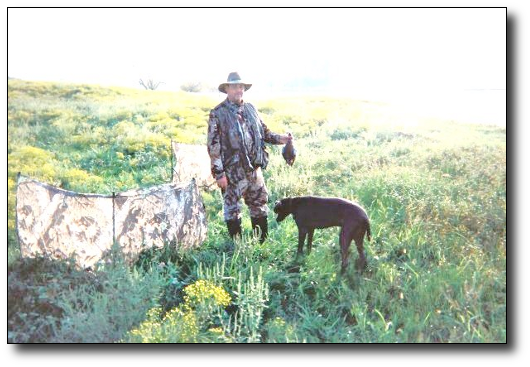 On opening day you would have found member Brian and his son Zachary, eagerly waiting for shooting time, at our famous "strip pits. For their dog Zeus, this was a new experience. They arrived early to allow decoy placement and temporary blind setups. 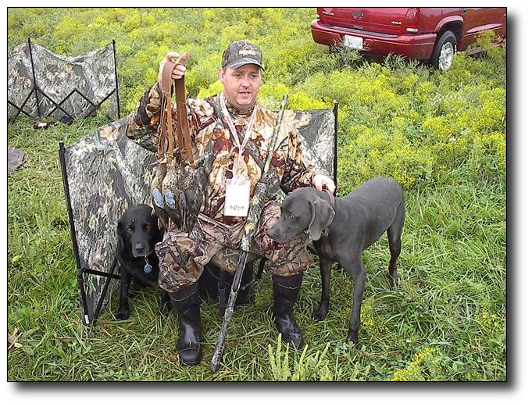 Spring turkey camo blinds were easy setups and were ideal for the fall teal season. We only saw about 30 teal. We bagged one each. For Zachary, it was not only his first teal, but his first duck! Ditto for Zeus. The following weekend it was just me and Brian. Brian had me convinced that there was going to be a migration of teal ahead of the oncoming storm front. Fifteen minutes before shooting time we were sitting out a major thunderstorm in our vehicles. Luckily it didn't last that long. My Dog Fay, in her old age, does not like thunderstorms or fireworks. She tried to sit on my lap while we were waiting out the storm. Yet, she will sit right alongside me in a duck blind and not be bothered one bit with my shooting next to her...strange dog! Once the rain let up, and the vehicles were moved to a safe distance, it was time to "lock n' load." Within ten minutes a flock of around 25 teal buzzed right over our decoy spread. They were flat out moving! No chance at a shot. I grabbed my duck call and gave a series of short quacks and some feeder calls. There was no sign of them. Just as we were giving up on that group, here they came! They were lower than low. They were "on the deck." They swung over the decoys, turned and came right over us. I don't recall if Brian or I hollered "take 'em!" Brian was the first to break the silence of the morning. Out of the corner of my eye I see two birds fall. I had two come directly over me. My first shot clearly missed, but the second scored on a single. Brian was wasting no time and two more explosions rang out from his direction. The flock did not disperse. They held together in one big ball. My last shot, along with Brian's dropped two more. 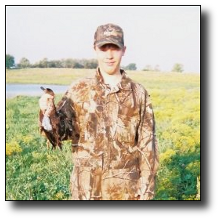 Six shots and five birds...one sailed (crippled) over the next pond and never found. Never the less, what excitement! What a way to bring in the fall seasons. Just like last year and the years prior, don't forget to send in your pictures and stories. I will leave out any pertinent information regarding the state, and the property number.